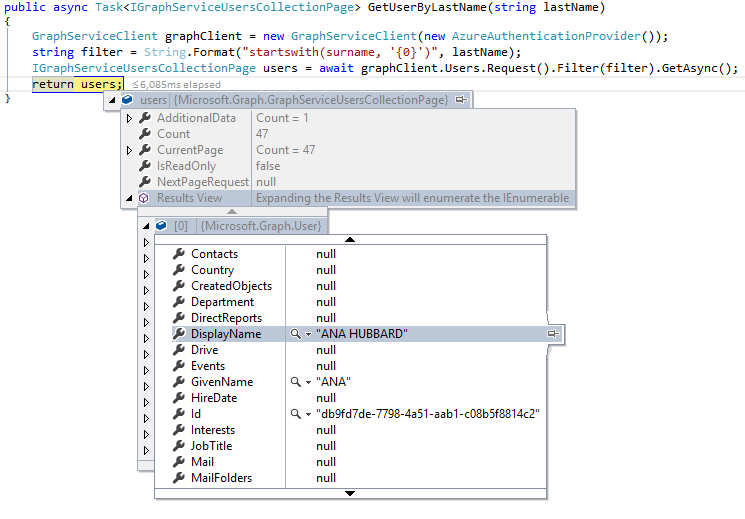 A month or so ago, the Microsoft Graph .NET Client Library was released. Working with the Graph client has largely been direct web requests up until now, so the client library is a welcome addition. However, as I started to explore the library, I discovered that finding documentation was a bit challenging. This is a basic walkthrough of the client library to help people to get started with their first calls. 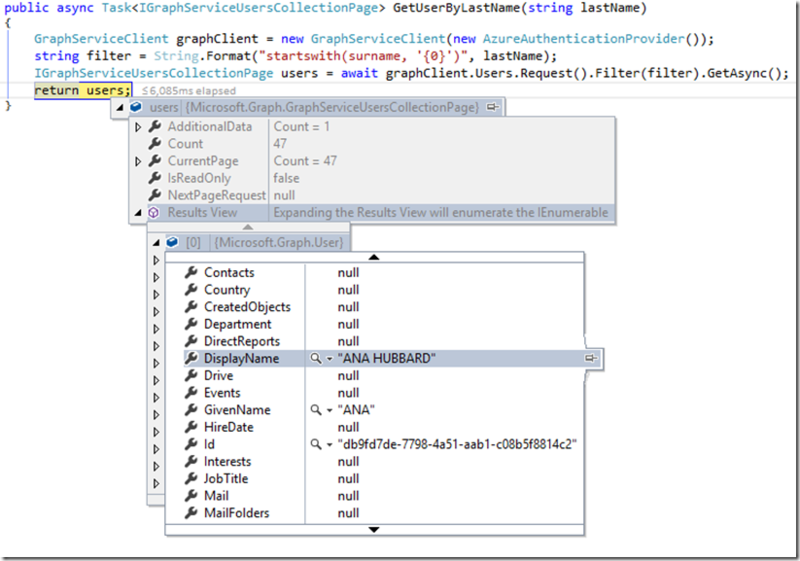 The Graph .NET Client Library is intended to be very extensible and work in a variety of situations. For this first introduction, we’ll just use Azure Active Directory and ADAL to authenticate ourselves into the graph. I’ve written about the AAD/ADAL process before, so instead of re-writing it now, you can follow the walkthrough here: Jonathan Huss – The Help Desk demo, Part 2 – Azure Active Directory. For the client library, we don’t need a certificate for authentication. We can just use a basic client id and client secret authentication model. 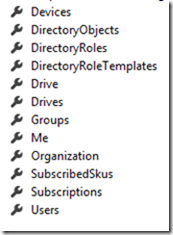 The first part of this post describes how to generate the client id and client secret: Jonathan Huss – Getting started with the Azure Active Directory Graph Client Library. So, be sure that you’ve created your application with appropriate permissions in Azure and have the client id and client secret available. As far as I know, there aren’t any pre-built AuthenticationProvider classes, so we’ll need to go create our own to work against Azure. This is actually sort of handy, since we could build whatever we needed if we were using some other kind of authentication, although some pre-built providers for known authentication sources would be convenient. What in the world should we do in that function? Well, if you’ve ever worked against Azure/O365 services before (or any OAuth service, really), you likely know that to authenticate to the service, you need to send an Authorization header that includes the Bearer token (commonly known as the access token). That’s precisely what we’re going to do in this function. We’re going to provide authentication details to the request. The idea is that when the library sends the request, it passes through this function and provides us an opportunity to inject our Bearer token into that request. This function reaches out to the login.windows.net authority, passes our client id and client secret along with our resource identifier, and requests our token. Once the token has been received, it’s injected into the Authorization header with the Bearer prefix. For the sake of making this fairly clear and concise, there’s no storage or refreshing of the token, nor are there any Settings, ConfigurationManager, or token cache implementations. There’s also no error handling. Certainly in a production environment, you’d want to incorporate those components. Piece of cake right? Yep. Note: This is an app-only authentication model. The token acquisition steps are slightly different for a delegated authentication model, but can be found in numerous places on the Internet, such as https://msdn.microsoft.com/en-us/library/azure/dn645542.aspx. Now that we have our client all setup, let’s see if we can retrieve some data. 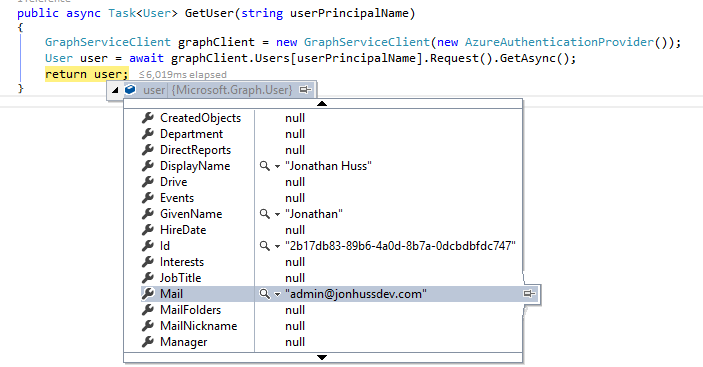 There are quite a few properties on the client object that correspond to the Graph URL segments (documentation on URL segments here: http://graph.microsoft.io/en-us/docs). If we run that with a breakpoint, we can see that, in fact, it does retrieve the requested user, which is sort of convenient that it works as anticipated. The Graph Client Library has quite a few objects available for interaction. 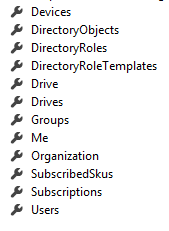 At least as of the current version of the Graph Client Library (v1.0.1 on 5/24/2016), the available objects are as follows. I certainly expect this to grow as the Graph itself grows. There is quite a bit more that we can talk about regarding the Graph Client Library. I plan to write a follow up post that describes more of the functionality. Definitely comment and let me know what would be useful for you and I’ll try to include it. Hopefully, though, this is a good starting point to get folks past the “How in the world do I get started with the new Graph Client Library?! ?” question. Thanks for this article, I was struggling to find meaningful guide and resources for ClientCredential Auth with Microsoft Graph. Your article explains this topic very well. Really appreciate it! Can you share the bits of code that aren’t working? This and the one about creating an app in azure were a life saver but I do have a qustion. So following your setup here I can get connected to graph no problem and query the users for users but the problem is almost all the properties are null which isn’t very helpful. Do you have an incite on why that is or what we would need to do permission wise to make sure the application can access more information? 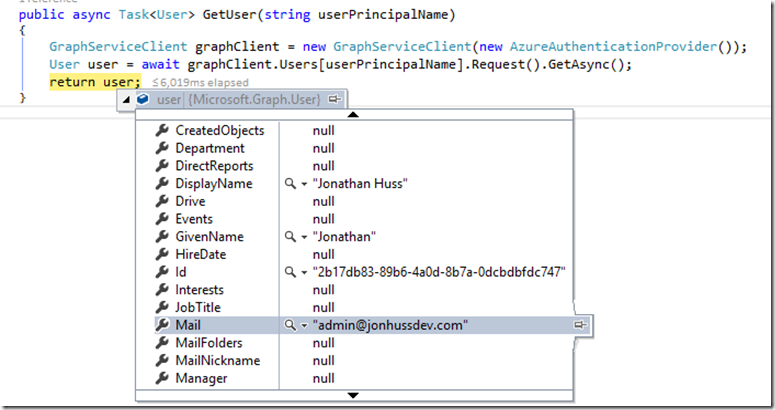 Have a look at the follow up post, here http://blog.jonathanhuss.com/more-about-the-microsoft-graph-net-client-library/. It describes how to use the Select function to include particular properties. Using the authority https://login.windows.net doesn’t seem to work properly, comes back with 403. Changing it to https://login.microsoftonline.com works as expected. Thanks very much for this article. Thank you so much for this post, really helps get even a sliver of understanding of the newer Graph API, especially regarding pulling more than 100 results from AAD! Merging your code with the pre-made code that comes with the ASP.NET MVC Web Application with Work/Organization sign on authentication was pretty straight forward too. 1. They must have been shared using the “new” approach in O365. If not, you need to deleted your shared calendars (as recipient), remove all the shares (as owner), then re-share thorugh the web portal. I asked on StackOverflow about this and was told I need to use “Authorization Code Flow”, would you (or anyone really) be able to help expand on this? Or maybe even show how to get the .Me functionality working? The guidance you received is accurate. This demo connects to the Graph via an app-only flow. Basically, it’s connecting as an application rather than as a user. As such, /me/ isn’t really supported. If you want to use the /me/ construct, you’ll need to switch the authentication type to use a user based flow instead. More information here: https://docs.microsoft.com/en-us/azure/active-directory/develop/active-directory-protocols-oauth-code. Simple but powerful article. I was struggling to understand for the past 2 days. This article saves my time. Good job on this article. It helped me to reach a new understanding of Microsoft.Graph. trying to follow the guide but slightly confused. Where does GraphServiceClient graphClient = new GraphServiceClient(); go? What parameters go in it? From my understanding, it goes in the main function, no? The parameter for the GraphServiceClient is the authentication provider class. There’s a sample AzureAuthenticationProvider class in the post. Then, you can create a new instance of the Graph client anywhere that you need to make a call to Graph, including the main function, but also in other functions as well if need be.